As usual, we have so much left over Mandarin Oranges despite not buying any this year. Each year, half will be left to rot and thrown. I felt so bad. This year, since we are not having guests over, our initial plan was just to buy a small box but we were presented with three boxes instead. I am not sure whether you experience this. For me, after eating too much of this fruit, I tend to develop sore throat and then follow by a cough. A tip from a doctor, she advice me to always wash the Mandarin Oranges, it is the chemical on the skin that causes us to have sore throat as we uses our hands to peel the skin and touches the fruits before we pop them into our mouth. So this year, I did wash all my oranges but unfortunately, after the exchange of oranges, I overlooked this part and now guess what, I am down with sore throat again. Thus I can't really tell whether the doctor's advice really works or not. Well, I will try this method more diligently next year and let you know the outcome. My girl loves Mandarin Oranges but she is so daunted by those seeds. Since I am not feeling chirpy and strong and am definitely not in mood for baking but yet I wanted to prepare something for dessert. I have some left over Yuzu juice from a dessert I prepared awhile ago and I have packets of Konnyaku Jelly powder. So the quickiest and easiest way is to make Yuzu and Mandarin Orange jello. Bingo! 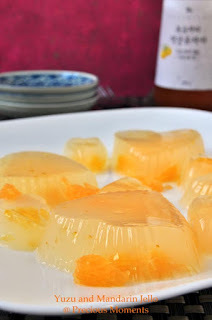 Many years ago, I made konnyaku jello from scratch. That is konnyaku powder with citric acid. These days, it cost so much to buy a bottle and yet I can't guarantee I will used all up within a time frame so ready made packet is a way to go for me now. Perfect choice as it really sooth that scratchy throat and best of all, my little princess loves it! Mixed everything except the fruits and bring to a boil. 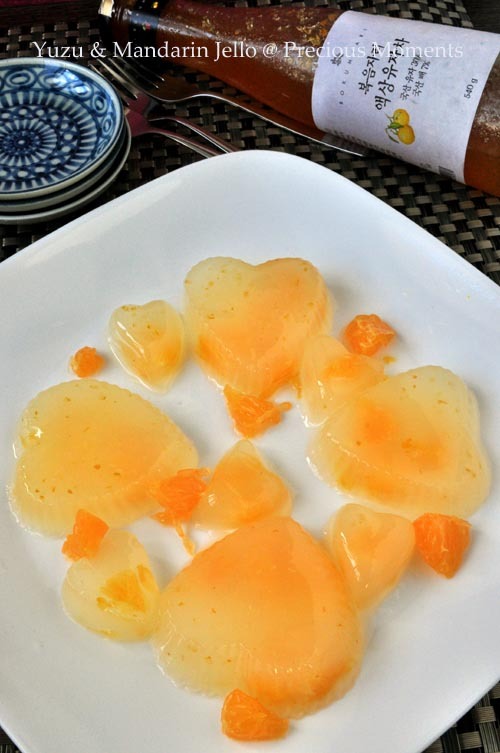 Pour into mould and add in mandarin orange. Set aside to set and chill. I saw something similar at Ann's blog too. This is definitely a great way to use up all the left over mandarin after CNY. Looks very refreshing. Definitely a hit for this hot weather. Thanks Zoe for telling me. Guess we had the same thoughts about this dessert. Ann's version is so much prettier than mine. YB, indeed. Especially my throat was so scratchy.